Barcelona's 19-year-old wonderkid defensive midfielder Sergi Samper is expected to eventually make the step up to Barca's first team squad. Closely monitored by former Nou Camp coach, Pep Guardiola, there have always been high hopes for this Catalonian starlet. 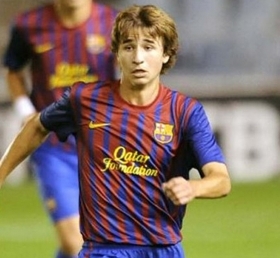 Since joining the Barcelona youth team back in 2001, Samper has slowly but surely worked his way through the ranks before finally making the progression to Barcelona's B team in 2013. This season has been his first in the 'B' team squad and he has continually impressed, playing in almost every game for the second string side. With a variety of brave displays at the heart of the Spanish side's midfield, Samper is showing that he will be an important option for the first team squad for many years to come. Solid in the tackle and with an excellent turn of pace, the 5 foot 11 midfielder could be a mainstay in Barcelona's squad for years to come. What is most impressive about this midfielder is that he is already starting to show that he can adapt to Barca's typical passing style, as the player is comfortable with the ball at his feet and obtains an excellent pass as well. Samper signed his first professional contract at Barcelona last June and has a further three years on his deal at the time of writing. Many are hoping that he will eventually make the step up to the first team squad next season. There has also been talk of a brand new contract on the way. At international level, Samper has recently enjoyed his first call up to the Spain under-19 squad and has already previously played for Spain's international side at all levels. If Barcelona continue to develop this young talent, Samper will be an important player for both club and country for many seaons to come.